If you’re visiting with us for the first time, we’d like you to know exactly what to expect. We want to provide you with an experience that makes you feel confident in choosing us to help you feel great again. Our office atmosphere has often been described as warm and inviting, with a positive vibe that makes people feel welcome and supported. We hope you think so, too. Your first visit will take between 30 and 45 minutes. We ask that you wear comfortable clothing during this appointment. If you have any test results from other sources pertaining to your current condition, please bring those with you. Download and Print out forms! During this visit, we’ll deliver a report of findings, which is a thorough review of your examination and X-ray results. Customized care options will be discussed, and a plan of action reviewed to help you meet your stated goals. Once all of your questions are answered to your satisfaction, you’ll be able to start on your recommended treatment plan and receive your first gentle chiropractic adjustment. Subsequent visits usually take between 10-15 minutes. Re-evaluations are scheduled to occur every 10 to 12 visits to measure your progress and to determine the frequency of future appointments. 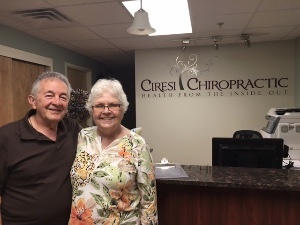 Once we’ve been successful in eliminating your pain and achieving spinal stability, many of our patients opt to receive ongoing chiropractic adjustments. These visits are usually referred to as preventative or wellness care. Wellness care is your choice, however. We encourage our patients to come in as long as they want to continue to experience the benefits of optimal health and vitality.